Judie Randall, Debra Battenfeld, and Connie Braton are three Minnesota based professional Psychics who work together as a group. By using their individual gifts, the Psychics in the Cities will receive and give you powerful and meaningful messages from Divine to enlighten your journey. 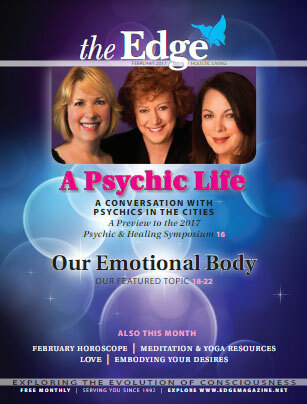 Enjoy our interview with the Edge Magazine. CITY PAGES IRON FORK 2016! We are so thrilled that City Pages has invited us to be a part of their 2016 Iron Fork competition on November 3! We'll be there doing readings and helping to support a great charity, Second Harvest Heartland. Come on out to this wildly popular event and enjoy the competition, feast on cuisine from some fabulous local restaurants, and sample the spirits concocted by top area mixologists. Hmmm, did someone say.....spirits??? Check out our new radio pod cast. We were interviewed for the International Festival of Angels expo. Grab a refreshment, put up your feet and listen to our on-air readings and Q&A with host Tina Michelle. We are now offering email readings for our clients. You can ask one question and receive an answer from two of the psychics. Turn time will be 3-5 days. Please see our Services Page. We are sponsering a "student table" at the upcoming LHSC Psychic Fair on April 6..
We have revised this class and are opening it up to the public. Anyone with questions is welcome to attend. This will also be a place for our students to practice their skills and gifts. Please see our classes page for more information. April 8 Class - Liberating Ourselves from FEAR!!! We are speaking. Come hear us!!! Come join us for this fun evening. Psychics in the Cities are offering a series of Interactive Workshops. A paypal button has been added if you would like to prepay. See classes page. We invite you to browse our site and explore how we work. We offer many services, events, and classes.